Josh is back, this time to talk about Enter the Janitor, the first book in his urban fantasy series. A janitor working for a supernatural sanitation company must track down a fledgling demigod before it’s corrupted or destroyed, all while training a rebellious new employee whose fluctuating power could trash an entire city. Me: Can you describe your writing for someone who is unfamiliar with it? Josh: In most of my writing, no matter what genre it is or length it reaches, I tend to focus on dialogue, with a particular love for banter between characters. 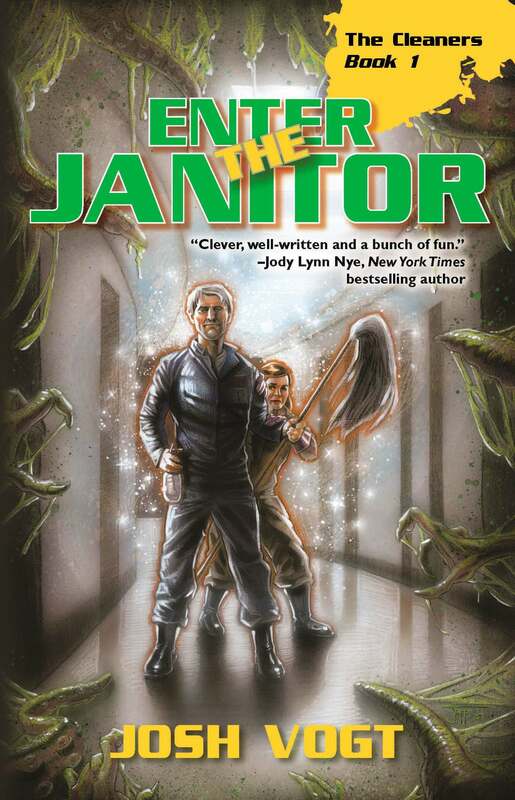 In Enter the Janitor, I aimed to emphasize the humor side of the story more than I had in previous stories—and found I really enjoyed working to bring the comedic elements to the surface as much as possible. Me: Would you want to live in the world of your book? Why or why not? Josh: The world of The Cleaners wouldn’t look to different from our own, especially since the supernatural sanitation company the plot revolves around works to hide today’s magic and monsters from public view as much as possible. It’d be fun to work for the company, wielding mops like staves and toilet plungers like wands. While you might get overlooked by most people for doing menial labor, it’d be satisfying to know you were actually playing a vital role in keeping the world safe (and clean). Me: Why did you write this story? What is compelling about it for you? Josh: The idea grabbed me and just wouldn’t let go. I greatly enjoy urban fantasy stories, but many protagonists in them take on similar roles: cops, detectives, investigators, military, government agents, etc. I wanted to play with fantasy heroes who took on a far different mantle in order to go where they were needed and get the job done. Janitors and other sanitation workers are around us all the time, often doing their work without any sort of recognition. But what if they were fighting for our survival all along? Me: What surprised you while writing it? Josh: It surprised me how well the concept of magical janitors, plumbers, maids, and other sanitation workers actually fits with both ancient mythology as well as modern society! I mean, look at witches and their stereotypical image of flying around on brooms. Or the idea of reincarnation and our current focus on recycling. Or how the rise of sanitation and hygiene efforts has been a cornerstone of civilization itself. It makes an odd sort of sense. Me: How will reading it make people feel? Me: Was there anything you did deliberately while crafting this novel (pacing, language, symbolism…)? Why? Josh: Initially, the story wasn’t as humorously bent as it is now. It was more a straight urban fantasy with the occasionally absurd situation or banter. However, I realized the funny side needed to take more prominence, and so went back in and did my best to shift scenes and characters to reflect the humorous tone more—and I feel that definitely helped strengthen the story plus set it apart as a more unique approach to the genre.